In 1942, the US Navy committed to turning the Morro Bay estuary into a safe, fully-functional harbor for small ocean-going patrol boats. This project entailed making huge changes to the existing tidal basin, one of which was a eucalyptus trestle bridge from the foot of 6th Street (now Harbor) to the sandspit. The Navy's plan would transform Morro Bay forever. The little seaside town would gain a huge asset in the form of a safe harbor for small deepwater boats and a landing area that made docks and staging areas possible. To achieve all this, the Army Corps of Engineers moved a creek, tamed the harbor entrance, made new land, and added infrastructure to support operations. As part of this huge effort, the Corps (or its contractor) built the trestle bridge. In the WWII museum photo at right, you see the Navy Section Base in September 1942. Note the straight edges of the bulkheads behind which the staging areas of the harbor were made from fill dredged from the bay. The north T-pier is only partially done (the second arm was completed later), and the south one not even started. In the mid-to-lower right, you can see the trestle bridge heading out to the sandspit, with parts of wartime Morro Bay in the lower left quadrant. Exactly why the Navy built the bridge is somewhat of a mystery. One possible answer is that it provided an easy way to get material quarried from Morro Rock to where the new south breakwater was built. The Rock was a convenient source of material for breakwaters and jettys, both in Morro Bay and elsewhere, such as Avila--it was quarried until 1963, when public pressure made the authorities put a stop to the defacement. The South breakwater the Corps built was an important part of making the harbor more usable by taming the impact of waves and tides on the harbor and controlling the sand or silt that always threatened it. The breakwaters were not well engineered in the beginning, and had to be rebuilt twice in the mid-fifties and again about 1964. The 1964 job was done with modern wave analysis and better materials, and has withstood the pounding from the persistent northwesterly winds and the swells they raise. We do know for certain that the bridge was used by the Coast Guard in 1943 - 1945 to allow beach patrols to cross to the long undefended shore of the sandspit. 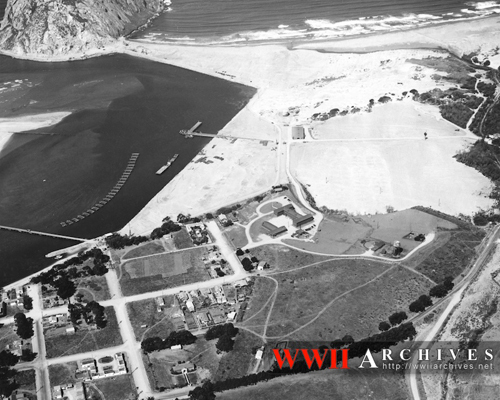 And once the Amphibious Training Base was built in early 1944, thousands of soldiers and marines--and their jeeps--crossed the bridge for training exercises in the dunes. To this day, people find expended shells and other debris from World War II on the sandspit. 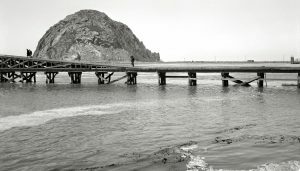 In early 1946, Morro Bay residents and the Chamber of Commerce began agitating to have the trestle bridge taken down because it prevented larger boats from reaching the southern parts of the Embarcadero. The Board of Supervisors agreed and allocated $25,000 to take the bridge down. Despite the fact that this was a large sum of money in 1946 (much larger than it is now! ), the Supervisors had a hard time finding a contractor. Eventually, the bridge was taken down in stages, leaving a short segment where it anchored at the sandspit. The photo with the racing boats was taken about 1951. Even today (early 2017) you can still see tiny remnants of the bridge on the sandspit. Walk toward the bay next to the Hofbrau Haus at the foot of Harbor Street, and find an interpretive panel about the bridge. The panel is approximately where the bridge connected with the Embarcadero, and looking in a southwesterly direction (with binoculars prefereably) you can find remaining pilings.